· Firstly, inform your little one as early as possible. Give him the needed time to get used to the idea whilst talking about the move often. This will help in highlighting that it is going to happen for real. A kid’s immediate reaction can be fright for the unknown. As a parent you need to give plenty of information about the move so that your tot can be calm and at peace. · Keep your child as involved as possible. Relocation is hard for everyone, but your relocation process will be a lot more convenient and easy if your tot is kept in the loop. Besides, make certain your child knows that he can ask you any question related to the move. Studies have shown, most kids are concerned about their new school, dog and neighbourhood. · Experts say that when you write the date on the calendar of your moving day children are better aware of when it is happening. · Time and again encourage your child to say what he feels. For instance, you could even ask them as to how do they plan to set up and decorate their new room. This way, it will help them get familiar with their new surroundings. 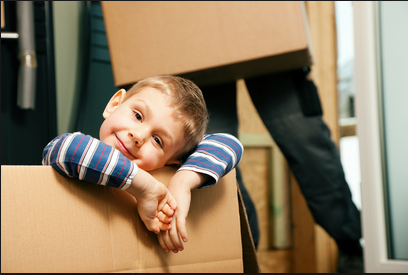 · If he is not too young ask him to help you pack. You can give him a list of things to do or maybe just help you with sorting things. Use an easy packaging material like bubble wrap and show him how to properly pack and label. · Prepare a farewell party. It is a great way to create some lasting memories of the old home. Be original and be creative. It will ease the tensions of your child. Last but not the least, keep it optimistic. Even if you are not as excited as you should be it is extremely vital that you are upbeat about it in front of your kid. And never make the mistake of comparing the old home to the new one.